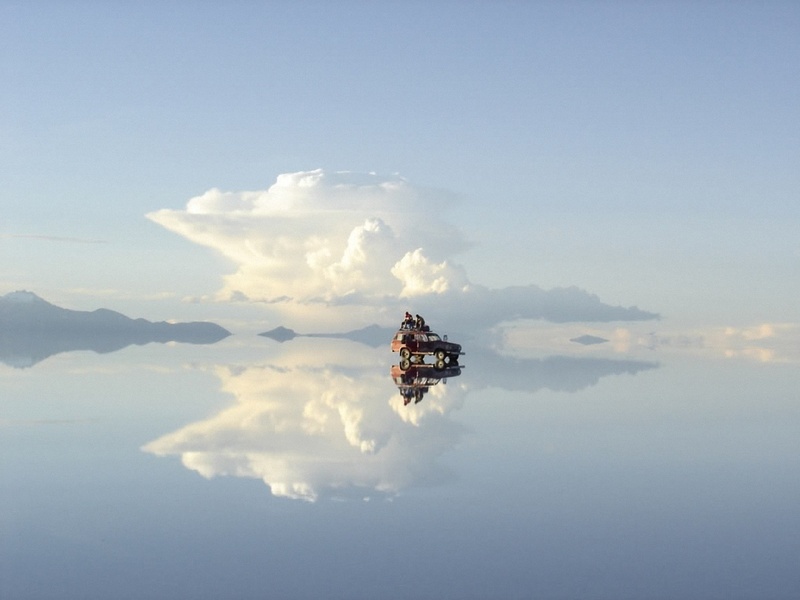 Huge territory located at the height of almost 4 km above sea level that occupies over 10 000 square kilometers is nothing else but flat lake Uyuni. When here, you don’t entirely get at first what have this enormous expanse arose from. It doesn’t really look like sand and it is way too weird for snow that doesn’t melt under above-zero temperature… So when your sight fails you should rely on other senses, in this case – on taste. You only need to try what’s beneath your feet without any misgiving and everything becomes clear at once – it is bog-standard salt. On the outside the place falls a long way short of common conception of a lake. But if a time machine could have sent us about 40 thousand years back an ordinary water file called Minchin would have burst upon our views. 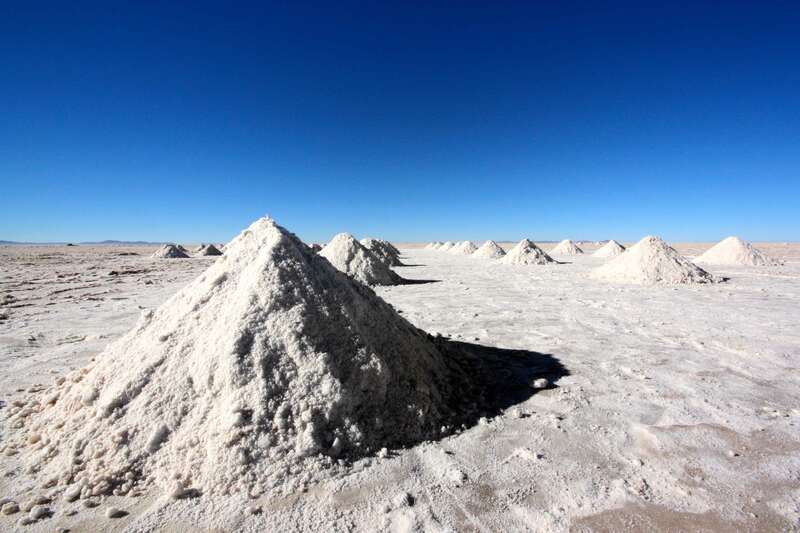 After a lapse of centuries it got separated into already familiar salt depositary Uyuni, another similar one – Salar de Coipasa as well as into two completely “normal” lakes with interesting names Uru Uru and Poopó. But only the first one managed to achieve global notoriety. To a certain extent huge dimensions of the “dry” reservoir, which made it the biggest salt lake on the whole planet, attributed to that. As a rule, walking “cruises” along Uyuni don’t take place in fine weather (customary for all kinds of journeys), but in a season when the sky is fully covered with storm clouds. It lasts from May till November. 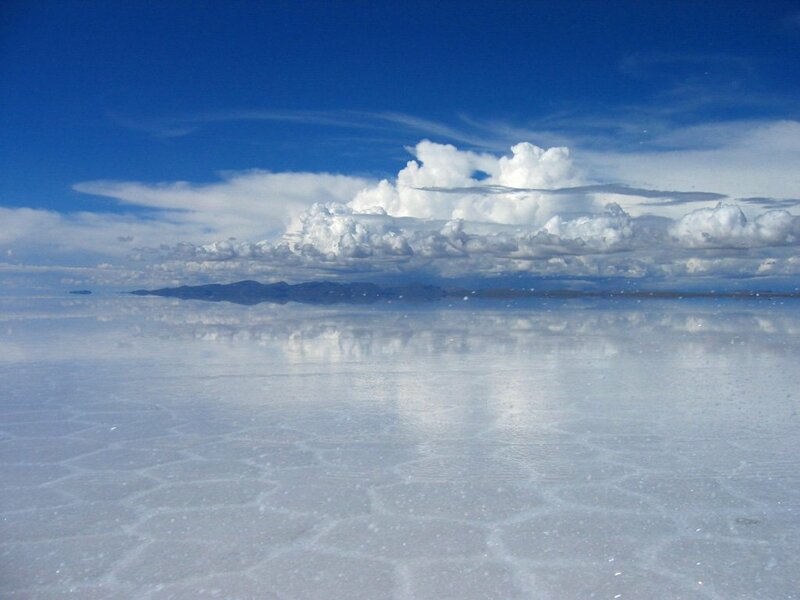 In this period all the salt is flooded with around 30 cm thick water layer, which produces an effect of an immense mirror that reflects in great detail clouds drifting high above. An unusual illusion becomes a background for unique pictures that are the main goal of the majority of trips. Inspired by amazing pictures and delighted recalls of the unique place, everyone is trying to get to Uyuni in rainy season. But should mother-nature refuse to flood everything with water by the time you arrive, there is no point in accusing yourself of bad luck and the weather of being unfavorable. Dry “climate” will offer a chance to admire other distinctives of the lake, particularly its wonderful fauna and flora. 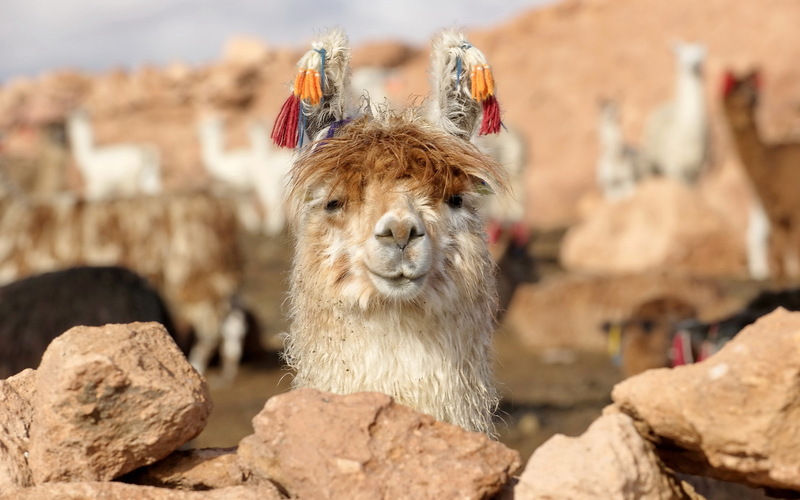 Domesticated alpacas walking around are the main live stock species in nearby villages and they like to wander to the desert to relish moss that grows here. Being accustomed to people they don’t mind posing to cameras. 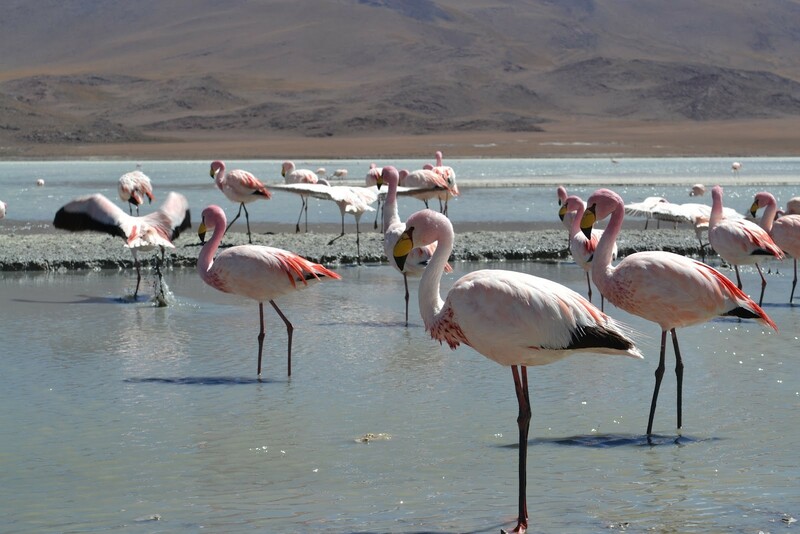 While it is better to watch flocks of long-legged flamingos from a distance – one false step and timid birds will take wings to create a pink cloud over salty expanse. Aside from them, among to feathered tribe, two extremes are seen here: massive ostriches and tiny hummingbirds. As to vegetable world, wet climate and specific ground do not constitute favorable conditions for diverse flora forms, instead, local many-meters-high cacti that surround the desert with a thorny fence can compete even with enormous Mexican ones. Watching mining of the thing we daily consume is also possible in Uyuni. Utilization of local salt reserves, that constitute about 10 billion tons, has been on for a couple of centuries thus bringing in additional money to state treasury. 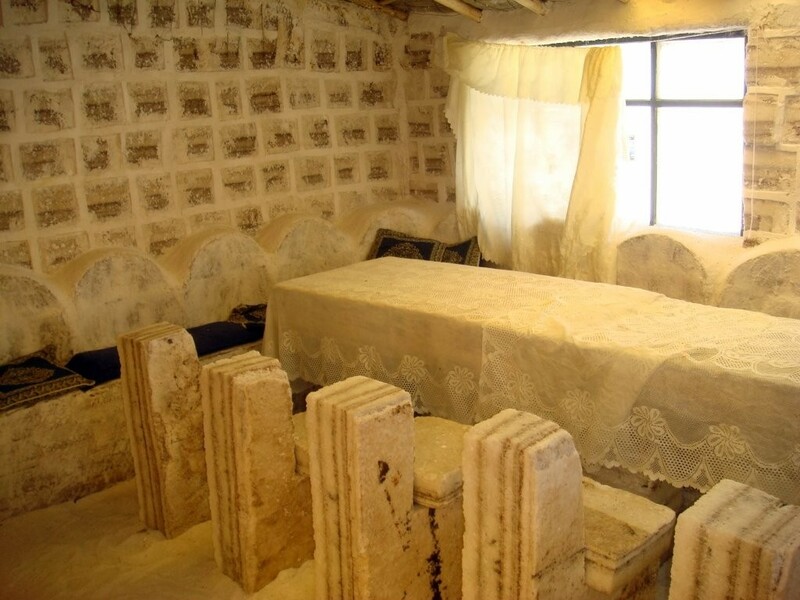 But some fifty years ago “digging” was far more sweeping and as a reminder about that period an open-air museum called train cemetery is situated three kilometers away from the lake. When in 1950s active mineral mining decreased drastically, employees of the railway abandoned all transportation equipment here for it to turn into another local place of interest with time. 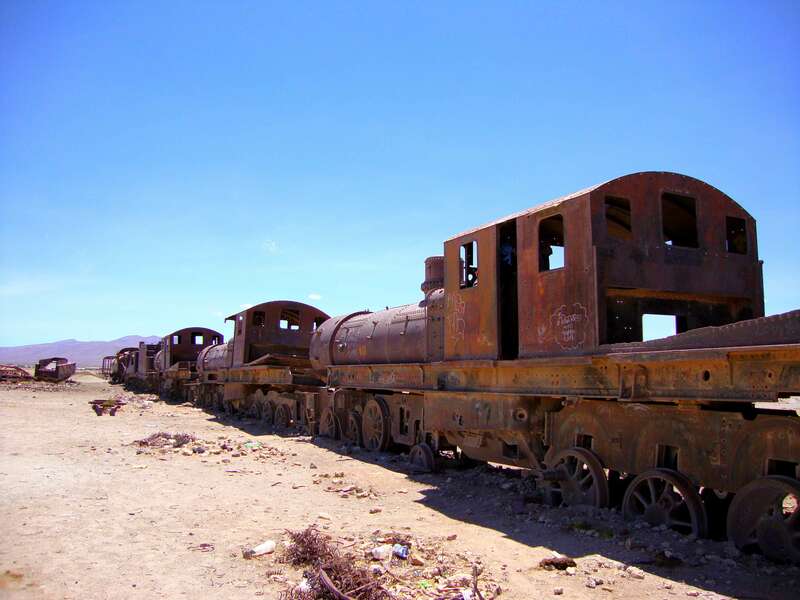 It was Bolivian authorities who initiated “reformatting” of old rail-tracked cars into an exhibition, when they started implementing a development program of such an extraordinary region in 2006.